Claude Monet first went to London in 1870 to escape the Franco-Prussian War. While there he would have seen and been inspired by painters like Turner and began to develop his use of bright colors that would become a defining element of Impressionist painting. After traveling and moving to Giverny, where he would have his famous gardens, Monet returned to London in 1899 and began work on a series of paintings depicting the Palace of Westminster, also called The House of Parliament, or simply Parliament. His Houses of Parliament series contains 19 canvases all exactly the same size and depicting the same scene from the same vantage point. Starting in February 1900, Monet began painting a view of Parliament from across the river Thames. From a terrace on the second floor of the St. Thomas Hospital, Monet could see the Houses of Parliament, including Big Ben, sitting on the edge of the river. In each canvas Parliament is on the right, with water to the left and in front and sky above. As in previous works, these paintings are studies in showing the changing landscape. Because his subject, the light, changes so quickly Monet would sketch out the building of Parliament before hand and then paint, adding the color and detail, while looking out his terrace over the river. In previous Series paintings, Haystacks and Rouen Cathedral, Monet showed the effect light and the atmosphere has on objects. While the Parliament series has the building, Westminster Palace is so distorted and obscured by the fog and smog it becomes secondary as the subject. For the Parliament series, we are not just seeing the effect of light on objects we see, Monet is showing the effect of light on the atmosphere itself. Even today London is famous for its fog, and in the 1880’s the Fog was at its peak being heavy and frequent. By 1900, the fog had been decreasing, but was still apparent and being thickened by the smog a result of London’s growing industry. Throughout the series of paintings Monet shows the river change from blue and green to bright orange and red lit by the afternoon sun. Monet’s brushstrokes create depth and layers within the fog showing the thickness and weight of the atmosphere. 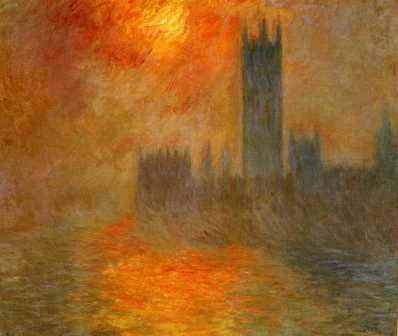 In one painting Parlement, coucher du soleil, 1902, the sun is setting behind the clouds creating highlights and shadows high within the sky turning the river into a mirror reflecting Westminster Palace. In another Houses of Parliament, stormy sky, 1904, almost the entire canvas is orange; as the storm, lit by the high sun, hangs over London darkening Parliament. A few of his canvases show the disc of the sun, visible through the fog and reflecting on the water, while others show a dark sky, the sun hidden behind a thick fog. Monet made two trips to London to work on the Houses of Parliament series, in 1900 and 1901. While he painted them from the St. Thomas Hospital, he returned to France with canvases and worked on them for the next three years not showing them until 1904. It may be thought by some viewers that their apparent lack of detail and the years spent working on them by memory may result in a different scene than what he saw, but modern researchers have been able to analyze his works showing his accuracy. By tracing known astrological patterns and solar geometry, not only have scholars been able to pinpoint the exact room and terrace he was painting from, they know the precise times. In fact, his depictions are so accurate that some study them to determine the elements that made up the fog and smog, and changes in the climate by his use of color.